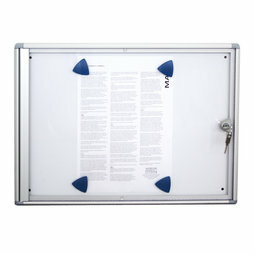 This display case is ideal to share information in apartment buildings, schools, companies, etc. The display window has room for 2 A4 sheets of paper next to each other. Thanks to the very flat design the case doesn't protrude into the room. The magnets used may not be higher than 1 cm. Beautiful design and strong: Boston magnets. Frameless swing door made of acrylic glass with integrated lock, includes 2 keys. The frame of the case is made of silver-anodised aluminium profile, the slanted corner pieces are plastic.